Race the State is a multi-sport race that will challenge competitors to race across a U.S. state. The second edition of the race will span Rhode Island August 6, 2017. Race the State is made up of multiple legs involving four different disciplines: Running, Paddle boarding, Kayaking & Cycling. 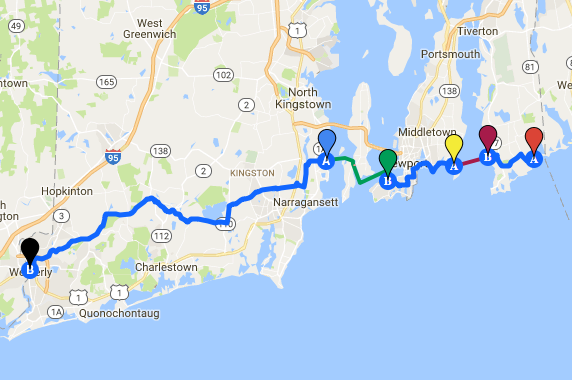 This is an event that spans the entire state of Rhode Island and as you will not be returning to the various leg start or finish lines throughout the race. YOU MUST have a support team in place to assist with dropping off and collecting equipment. We are offering support team assistance for an additional fee, which you can choose upon registering. Packet pick up details will be e-mailed to you at a later time. For kayaks: you must have an open water kayak: either a touring or sit on top model will work, we recommend a skirt. Please visit the Race the State website for further details. You can sign up as a 2, 3, 4 or 5 person relay team. That's great! We're stoked to have individuals taking on the entire state. However, given that this is as much a logistical race as it is an endurance event, we want to remind you that you will need a support crew to drop off and collect your equipment along the way. Be sure to read through each leg detail breakdown and make sure your support crew is familiar with where to go and when to be there. As a reminder you can choose to have a support crew provided to you for an additional fee, select that option in the registration process. We will score prone and stand up paddlers in different divisions. You must provide an image of your paddle board, paddle and PFD upon packet pick up. We will not accept inflatable boards. You and your support team will be responsible for drop off and pick up of your board during the race. The race starts at 5:30am sharp. Please allow enough time to get yourself to the start line. If you are in a relay two separate teammates can compete in Leg 1 and 2. Please familiarize yourself with the course and prepare for the distance. It is long and a bit hilly, however we are working on a few course modifications to reduce the mileage for this leg. The kayak transition area is on the beach adjacent to Sail Newport. Cyclists may drop off their bikes on Sunday, August 6th starting at 6am. All bikes must be in the transition zone no later than 8:00am. The bike portion of the race is a 28.5-mile route that is all on shared roads. Police officers will be stationed at significant intersections throughout the course. However, it is still the responsibility of the cyclist to ride in a safe manner and adhere to all road rules.